Grow a Sustainable Diet–the Book! I have written a book! 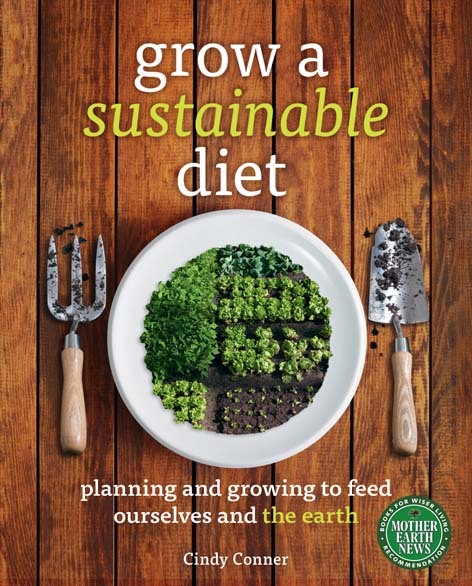 Grow a Sustainable Diet: Planning and Growing to Feed Ourselves and the Earth is being published by New Society Publishers. Look for it to be released in Spring 2014. To quote from their website, “New Society Publishers’ mission is to publish books that contribute in fundamental ways to building an ecologically sustainable and just society, and to do so with the least possible impact on the environment, in a manner that models this vision.” Sounds like a good fit for me, don’t you think? They did a great job designing the cover. For years people have asked me when I was going to write a book. They began asking me that when what I was teaching was already in the books I suggested they read, so I told them to get reading. What I am doing now is not readily available in the books presently on the market, so I’ve put my work into print. This book is for folks who want to grow all, or a substantial amount, of their food and do it in a way that has a small ecological footprint. Particular attention would need to be paid to crop choices for your diet and for feeding back the soil. The cover crop and garden planning information from my DVDs is included in this book, in addition to information about planning your whole diet from homegrown and locally sourced food. If you like what you have found in this blog and on my DVDs you’re going to love this book. I wrote it just as I have always taught, mentioning resources and books for further reference as I go along. As always, you’ll find stories from my personal experiences. I think a story sticks in your memory better than lists of what to do or what not to do. I don’t tell you just how much space it would take to grow all your food, since that depends on your crop choices, soil fertility, climate, etc. What I do is to help you think things through and determine the answers to your questions for yourself. For those of you who like my worksheets, this book shows all the worksheets from my garden planning DVD, plus a new one. From what I’m told, there will be a link in the book for you to access PDFs of the worksheets online. If you wanted, you could use the information from this book to plan a complete diet of homegrown foods. My intent is for you to realize what it would take to grow all your food, then plan accordingly to grow what you can, considering your skills, equipment, garden space and fertility, and time available. You could start today to compare what you are presently eating to what you harvest from your garden. Most folks would need to make some changes in their eating and in their growing to get them in sync. Really take a close look to determine what you do best in your garden. If you are not going to be growing everything, you could start now to see what is available locally. So, as much as this book is about growing all your own food, it is also about community. We need to be part of the food systems in our communities. There are changes coming in our society. Some predictions point to a collapse of our society, but I prefer to think of it as a change, and changes are not necessarily bad. Working together, we can make sure the changes in our local food systems are good ones. Besides, if change happens suddenly and people are unprepared, they will be lining up at your garden gate for some (or all) of what you are growing. You can participate in the food system as a consumer (buying what you aren’t growing), as a grower, or as a teacher. Once you learn from this book and all the resources that I suggest, and you have experienced some success in your garden, teach it to others. This book and my DVDs are teaching tools that you can use. After all, I developed these materials after many years of teaching at J. Sargeant Reynolds Community College. Besides chapters on diet planning, crop choices and management, garden planning, and seeds; there are chapters about including animals, food storage and preservation, and sheds and fences. I want you to consider the whole of what it takes to get food from the seed to your table, in a way that nourishes you and replenishes the earth. I encourage you to keep an open mind and make changes in what you are doing if they appear to be necessary. Most importantly, I want you to understand why you are doing what you do. New Society will be announcing Grow a Sustainable Diet with their other upcoming spring books. When they do, as with all new books, they will be offering a discount for orders before the release date, in case you are looking for a deal. Once it is released I’ll add it to my website at www.HomeplaceEarth.com along with my DVDs. Writing this book has been quite an adventure. I can’t wait for you to read it! Congratulations!!! I cannot wait to read it…and buy it for the library too! I want you to consider the whole of what it takes to get food from the seed to your table, in a way that nourishes you and replenishes the earth. That really says it all, doesn’t it. For so many of us, having a veggie garden is the goal. It’s just a piece of the process. Congratulations Cindy! What a fun cover! Can’t wait to read it, I know you’ve worked hard to create it. Proud of you, can’t wait to read it and share it with others. I’m so excited about your new book! Wish we didn’t have to wait until spring to read it! Congratulations! If it’s anything like your blog entries and DVDs, it will be fantastically informative and encouraging. Congratulations on finishing your project! I can’t wait to read it. Way to go , Cindy! I look forward to your book being published.